Motor vehicles, namely, passenger automobiles, trucks, sport utility vehicles, and motorcycles, and structural parts thereof, namely, motors, engines,transmissions and couplings. Abandonment Notice! On Wednesday, September 23, 2009, status on the trademark changed to Registration cancelled. Apply Now for this name starting at $449! 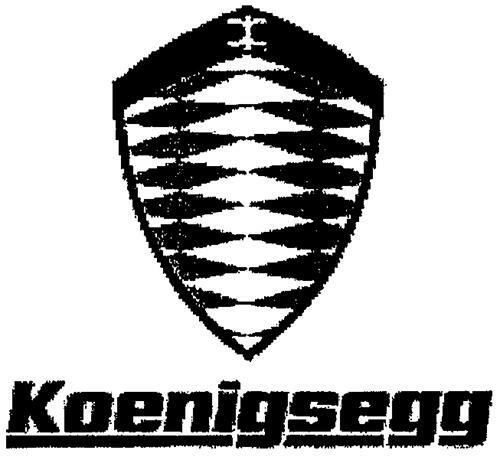 On Monday, July 21, 2003, a canadian trademark registration was filed for the above pictured logo by Koenigsegg Automobile, Inc. c/o Antonio Caselini, 155 Terraza Court, Costa Mesa, California 92627 USA, UNITED STATES . The Canadian IP office has given the trademark application number of 1184754. The current status of this trademark filing is Registration cancelled. The trademark is filed in the description of Motor vehicles, namely, passenger automobiles, trucks, sport utility vehicles, and motorcycles, and structural parts thereof, namely, motors, engines,transmissions and couplings. .
(1) - Motor vehicles, namely, passenger automobiles, trucks, sport utility vehicles, and motorcycles, and structural parts thereof, namely, motors, engines,transmissions and couplings.